"I fought in the war you know...."
Really? I know there's something wrong with my eyes, but surely you haven't? I've been walking into things, i've had people walking into me, as i just didn't move quick enough or whatever... i've come close to panic attacks in shops due to the lights there, and my over sensitivity to light in the first place..not being able to find my girlfriend back in the shopping isle is pretty distressing, or the od time I did venture out to meet with friends, and ended up in a shop it just became all too much.. overflood of lights, and (its true, eyes go, hearing goes up) overkill of sounds... so I just had to put my pride aside and get a cane for my own protection. This cane has become my daily companion, even now things have returned to normal status of me managing what is wrong with me.. and I normally do not need it. but sometimes a lens hurts, you have to take it out, and guess what, you are "blind" again, well its bloody handy to have it then... its just good i can fold it whenever needed and fits quite well in my Man bag that i need with me because of my lenses and lens fluids etc anyway.. 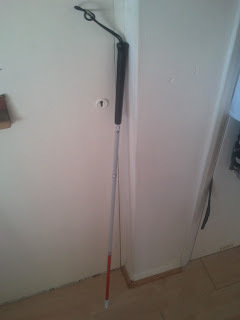 Anyway, here she is, my friend "the cane".